This month marks my one year anniversary working at LinkedIn. I have moved majority of my writing from here at Svbtle to LinkedIn Publishing as my post history from both sites show. This is in a sense a “pinned-to-the-top” post for anyone who reads or stumbles upon my Svbtle posts to check my articles out at LinkedIn. https://www.linkedin.com/in/chrisrng/ or publicly without a login at https://www.linkedin.com/today/author/chrisrng. Do you want to know the basic “todo mvc” of the Web Workers API? This is not the end all of what there is to know about Web Workers, but rather this a good first guide to exploring the topic. The posts on MDN would be a great resource for a detailed verbose explanation. The Web Workers API allows us to run scripts in the background independent of any user interface scripts that we are currently running (or will run in the future). Think of it as the ever listening phone in the comic above, it doesn’t interrupt the Pointy-haired Boss until it has done the work asked. This is a blog post about using the Web API URL.createObjectURL(). Here we will go through the use cases as well as the inner intricacies of what this Web API does. First up lets see how to use the API. createObjectURL is a static method provided by the URL Web API. Returns a DOMString containing a unique blob URL, that is a URL with blob: as its scheme, followed by an opaque string uniquely identifying the object in the browser. So when we invoke the function on the variable blob, we get back a persistent reference string with a unique URL that temporarily references to the in-memory blob object that lives in the Blob URL Store. It is a persistent reference since as long as that blob is in memory the reference string will be in play unless revoked. This blog post details the steps in which I’ve built my first Slack Bot with less than trivial functionality. It was created over a hackathon and was then released on open source as Pricelinelabs‘s leaderboard project under MIT License. This bot was built on Golang and uses nlopes’s Slack API wrapper. The post is not a how-to guide to building a Slack Bot using Golang but rather a recap of how the team built the Slack Bot. Special thanks to Ben and Alexey for being part of the hackathon team. In this blog post we deviate a little from the ES6 parade I’ve been writing here. 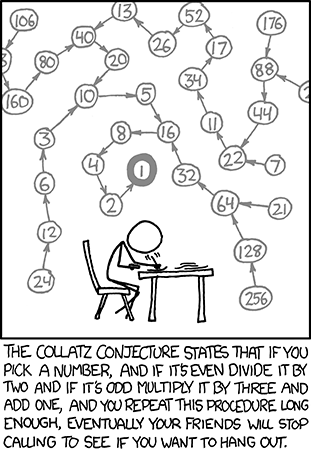 We dive into the Collatz Conjecture (otherwise known as the 3n + 1 conjecture) on today’s blog. The Collatz conjecture is the simplest open problem in mathematics. Take any positive integer n. If n is even, divide it by 2 to get n / 2. If n is odd, multiply it by 3 and add 1 to obtain 3n + 1. Repeat the process (which has been called “Half Or Triple Plus One”, or HOTPO) indefinitely. The conjecture is that no matter what number you start with, you will always eventually reach 1. Basically if we give the number 10 the breakdown is as follows: 10 > 5 > 16 > 8 > 4 > 2 > 1 (match!). The conjecture states that every arbitrary positive integer will reach back to the number 1 after jumping through the hoops. Sarah Drasner started the day with a talk on animation. If you hate animation, it might be because you’re doing it wrong. There was a big push for GSAP (GreenSock) as well as using SVG for animations and responsiveness. The aysnc and await pattern is essentially a decorator on top of promises and generators to have an even cleaner solution to the callback hell anti-pattern. Async Functions internally leverage both generators and promises. We initially were using an open source AngularJS slider by Venturorocket, however it had implementation issues so it was hard to iterate on. The idea then popped up to me to create a slider as a programming challenge. I then started and finished development on the internal slider component on August 2015.